Flavius L. Brooke was a native of the Province of Ontario, Canada, born on October 1, 1858. In Ontario he obtained a literary and professional education. At age 20, he began his law studies and spent four years with the law firm of Mowat, MacLennan and Downey. He was married on November 24, 1884 and fathered four children. He came to Michigan in 1885 and until he became a judge, practiced in Detroit. During part of this time he was associated with the law firm of Carpenter, Brooke & Haigh. 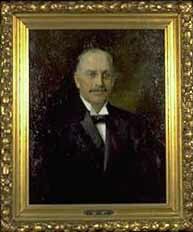 He commenced his judicial career in 1901, as a Judge of the Wayne Circuit Court. In 1908, when there was a vacancy on the Michigan Supreme Court bench, which according to custom should be filled by a Wayne County lawyer, his was the only name suggested and he was with practical unanimity selected to fill the position. In 1909, Brooke began his 12-year service to the Court. What most conspicuously distinguished him from other Justices was his remarkable facility for writing opinions. He could sit down and as fast as he could write with a pen or dictate to a stenographer, compose an opinion, putting it in such a shape that it could, without material revision, stand as a judicial opinion. It was in this way that his opinions were habitually prepared and they are creditable opinions. They are clear, direct, concise and uniformly appropriate to the case under consideration. This talent contributed very much indeed to the value of his judicial services.